We protested outside Northern Metropolitan Region office. Our banner looked great attached to the fence and we handed out information packs and earplugs - to illustrate that the department isn’t listening. Although these were received well by many entering the building, management were obviously not pleased and a (very friendly) security guard was in attendance. 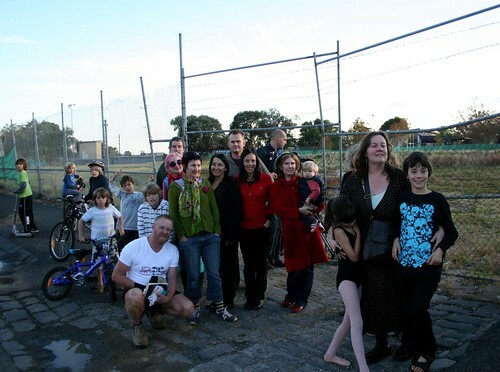 We planted a field of dreams at Bridges Reserve, Bell Street Coburg. 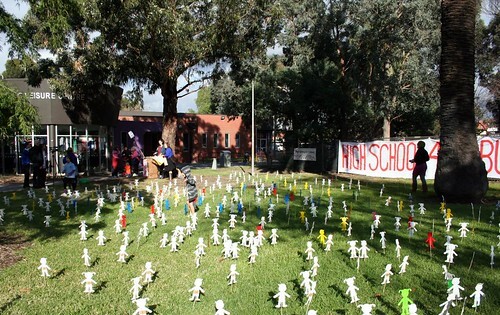 The 100's of cut out kids represent the 1000's of children in the Coburg area needing a local high school. There were about 3,900 chidren aged 5 -9 in our catchment (Coburg SLA plus West Preston) in 2006 so we estimate there are about 4000 high school aged kids now. Thornbury High kids and their teacher from Channel 31 Class TV also took some footage for a story so we will keep you posted about that. 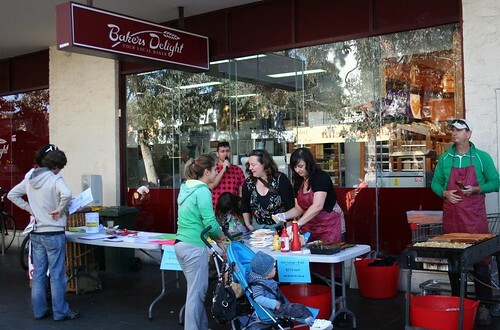 Thanks to all who came up for a chat and a snag - as usual very sad to hear from so many who have moved away from the area due to the lack of an open entry high school in Coburg. You can see the rest of our Lack of Education Week photos on our flickr page here. And there was plenty of education spending to go round. Labor committed hundreds of millions of dollars of state money to school buildings, all very welcome and appreciated but Coburg doesn’t even have a school. And that spending will be on top of the federal money expected to come next week. DEECD spent over $4 million on the Shine media campaign, enough to fund around half an open entry high school. This begs the question – what is more important – education or telling everyone about it? 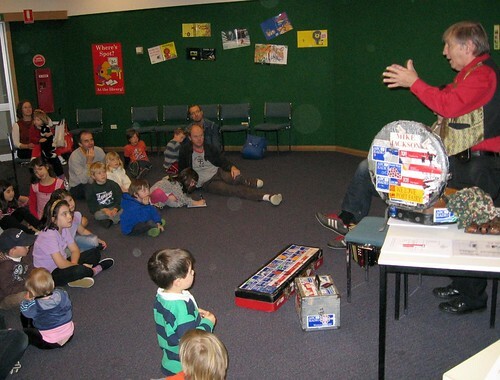 Mike Jackson, Coburg local, family entertainer and musician extraordinaire wowed the parents and kids alike at Coburg Library on Saturday 8th May, 2010. In a mini concert in aid of the High school for Coburg campaign, Mike amused and entertained with a whirlwind of instruments, songs, stories, lots of laughs, juggling and string. Many thanks to Mike and Thom Jackson for their time and support and especially for his most requested song Dr Knickerbocker! 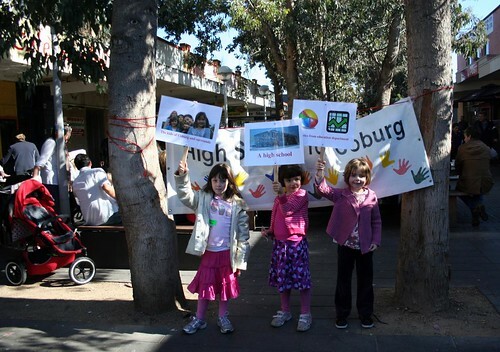 Children at Coburg West Primary School launched HSC’s Lack of Education Week last week. 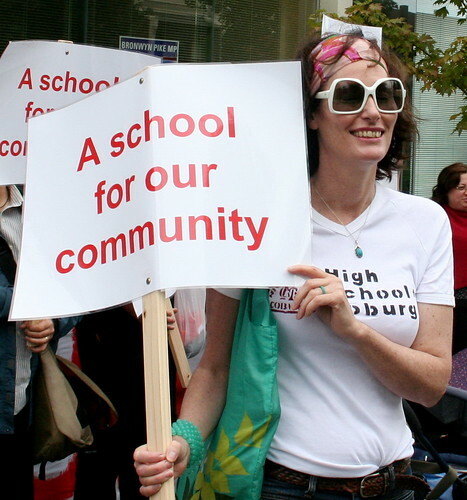 “There is nothing for secondary school students and families to celebrate in Coburg,” said Cate Hall, co founder of High School for Coburg. Lack of Education Week will run from Sunday 16 to Saturday 22 May, 2010. We have planned the following activities. Protest outside Northern Metropolitan Region office - Level 2, 189 Urquhart Street, Coburg (in the grounds of the Coburg Senior High School). HSC will be handing out earplugs as the department isn’t listening. 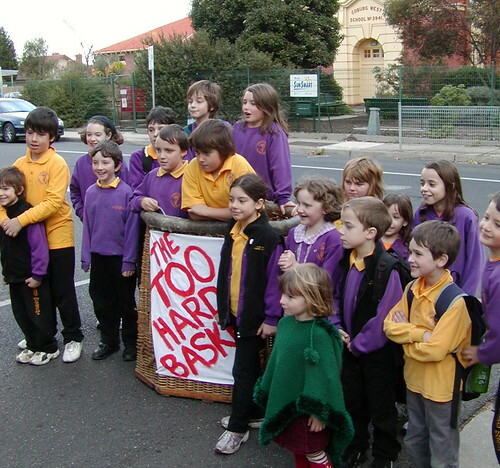 The ‘Too Hard Basket’ will be on display – a giant basket where DEECD have put Coburg children, the idea of a high school, our requests for meetings, information and a real taskforce. Bridges Reserve, Bell Street Coburg (opposite Elm Grove, near Sydney Road corner). 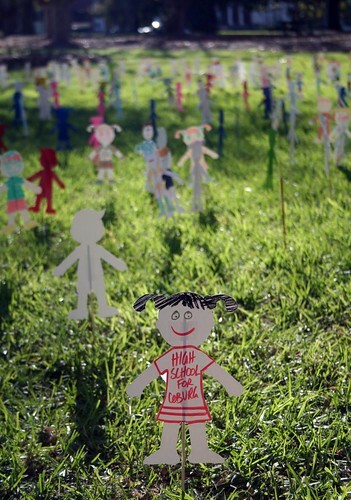 Field of dreams – HSC will be planting cut outs of children to represent the number of school age children in the area who need an open entry secondary school – approx 3,000. The ‘Too Hard Basket’ will also be on display. Surveying locals on options for a new high school and collecting signatures on the HSC petition. The ‘Too Hard Basket’ will be on display. This is a great opportunity to come and have a chat. HSC are very happy with the story put together by Cheryl Hall and her team at Stateline last Friday night. They managed to broaden the issue while still giving us plenty of coverage. You can view the story and read a transcript of the broadcast here. 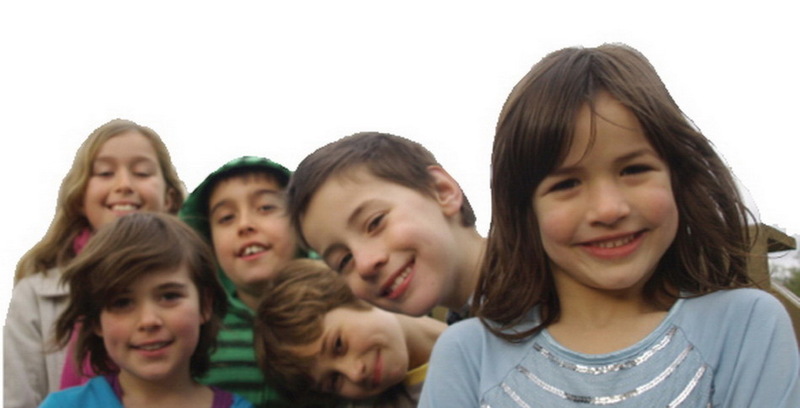 Newlands Primary - (the little school that could !) was in plenty of footage and is a great testament to how good the outcomes can be when a school is supported by its local families. Stephen Jolly highlighted a problem Coburg shares with Richmond - namely the neglect of it's boys in terms of state secondary provision. Principal of the new Albert Park Secondary College, Stephen Cook was speaking our langauge when he said "local kids for local schools "! Real estate agent Rocco Siciliano pointed out that families are moving away to get in the zone for schools. Frustrating - she said "You do have to look really closely at the real demographics, .." Of course we are looking at real demographics. Now we need a real task force, as asked for by Christine Campbell MP and announced to the media by Bronwyn Pike, to look at this data. According to the date contained in HSC's submission to the 2010 Victorian State Budget, there are roughly 4000 high school aged children in the Coburg area. Bemusing- she continued "not just how it feels in the community, but how many children are being enrolled in kindergartens and preschool." Surely massive kindergarten and preschool waiting lists strengthen our case and demonstrate the need for an open entry high school in Coburg? Not Quite Right - she said "There were 12 government secondary schools within a 5.5 kilometre radius of the suburb of Coburg." Highlighting of the 'were' is HSC's. 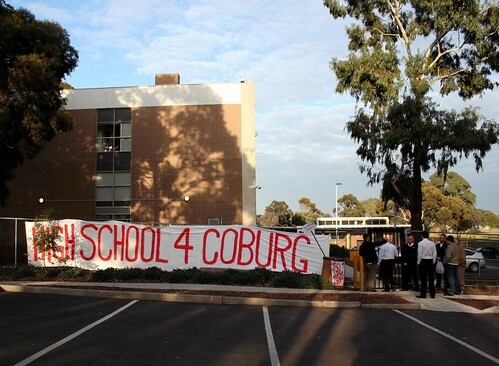 There used to be 12 schools but now there aren't any open entry high schools within 3.5 km of central Coburg. From where we sit in North Coburg, from the list of schools last suggested by the minister as options, Thornbury High is the only co-ed State secondary we are in enrolment zone for, even though it takes 55min on 2 buses to get there. 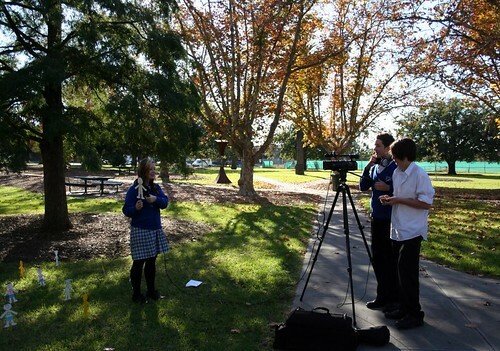 It is important to note that due to 33% increase in enrolments this year, Thornbury High is going to begin capping year 7's at 200 in 2012 . The school will then favour year 7's for whom Thornbury is their nearest school potentially cutting off that last option. Then where will we go?